The first batch of mushrooms (smaller ones) for the Fungus Forest. More on the way. Also a Wyrding Well, which is described as where the "blood of the earth," an amber liquid, bubbles up to the surface. Mine's more like a spring than a well, but I thought that was fitting. Sinister Statue and one more small 'shroom for the Fungus Forest. Very cool! 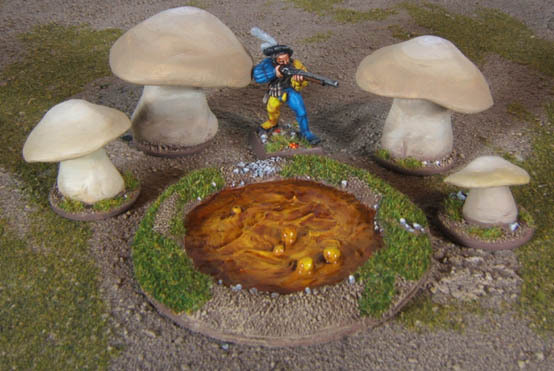 I like your terrain additives ideas. The Ghost Fence is a "mystical" terrain type from WFB 8th edition. In the new terrain system, terrain items are more likely to be "mystical" (even yet more special rules & random elements) than mundane. 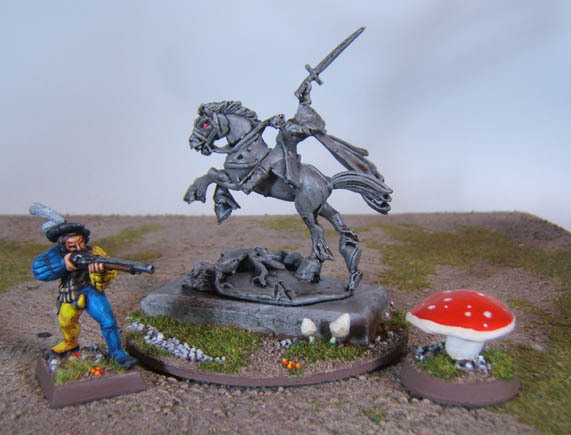 Sometimes I do miss playing Warhammer with you guys,but its too late since I sold my stuff.I'm certainly not forking out the money for the new rulebook,either.I'm too busy working on my BP AWI,which is going to be 3 times the size of my 1812 stuff! Now see, I would love to play some BP instead of WFB. But I play WFB because that seems to be what everyone else enjoys. 8th edition has turned me off a bit, but I've grown into a state of denial and just play it because it's better than not playing anything. I've looked into getting some 15mm SYW or AWI, but didn't want to start in on a project and have it dead before it hits the operating table. Don't worry,you'll get in on it when I run something.The only thing that I'm afraid of is that our mutual friend's table wont be big enough,even at half scale!I'm looking right now at 30+ units with what I've already got,and with the new Blue Moon stuff,who knows? Heh. Can you imagine trying to play BP with 28mm figures when space already becomes an issue at 15mm? I'd really like some more regular gaming opportunities outside of Warhammer, though.